What is Resonant Bodies Festival? When and where is the next festival? How do you select performers? Where can I learn more about RBF? 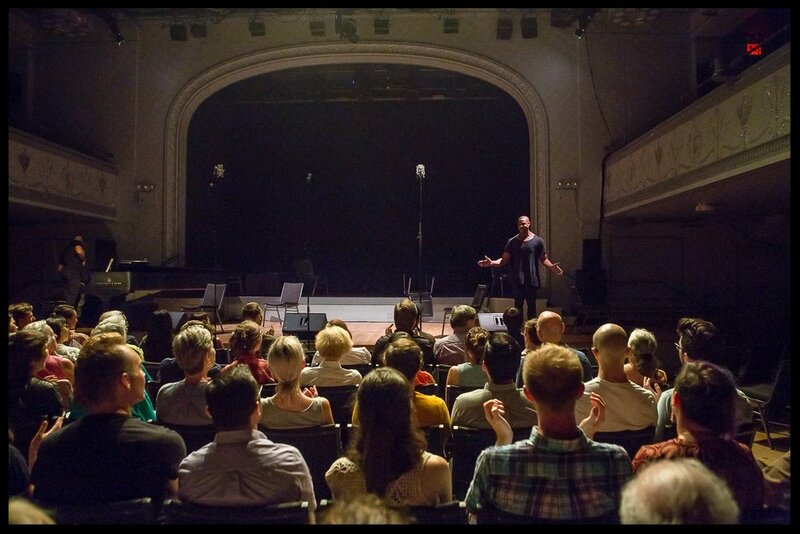 Resonant Bodies Festival—“in equal measures intelligent, playful, ambitious and moving” (New York Times)—is an annual series of contemporary vocal music festivals. Each festival presents nine dynamic vocalists across three nights, showcasing "today’s most talented singers” (Feast of Music). Founded in 2013, RBF has already made an important contribution to the new music scene and is a one-of-a-kind opportunity to hear virtuosic vocalists perform cutting-edge repertoire in New York City. The seventh-annual NYC Resonant Bodies Festival will take place September 3-5, 2019. Stay tuned for more information, and sign up for our mailing list to stay up-to-date with all of RBF’s goings on! Each concert runs between two and two-point-five hours. There are three vocalists featured on each of the three nights of the Festival, and each vocalist presents a set running approximately 45 minutes. There is one 20 minute intermission between the second and third vocalists. Artists for Resonant Bodies Festival are curated by Festival director Lucy Dhegrae. RBF presents a wide variety of voices and styles, and seeks captivating performers and virtuosic vocalism. We do not accept unsolicited project proposals. The reason for this is that RBF does not curate repertoire; we only curate performers. We want artists to have complete control over repertoire, and we want to give them freedom and encouragement to create new work or take their artistry in a new direction. We even want to be surprised by what they choose to program. Those interested in performing on the Festival are encouraged to send links to videos and recordings in an email (resbods [at] gmail [dot] com), as well as invitations to upcoming live performances in the New York City area. If you would like to be considered for the Festival, then we would love to get to know your work (if we are not already familiar with it). Prospective artists are encouraged to attend one of our Festivals, whenever possible, and to explore past Festivals on our Vimeo, YouTube, and Soundcloud pages. MRMR is a collection of digital resources provided by the Resonant Bodies Festival to vocal performers, composers, and our growing worldwide audience. This collection includes high-quality audio, video, and photo documentation of each Festival; the Resonant Bodies Podcast; and our crowdsourced Contemporary Vocal Music Database. You can learn more about RBF—including information about past and future Festivals, our history and mission, our supporters and sponsors, etc.—by exploring the links at the top of this page. You can also visit our numerous social media pages by clicking on the links at the foot of this page. If you have any further questions, you can always send and inquiry to resbods [at] gmail [dot] com.